Matej Tomažič from famous restaurant Majerija invited Dario Cortese to give an introductory course in wild edible plants foraging. The word rapidly spread out and here we are – more than 15 foraging enthusiasts gathered on a mid April sunny afternoon. The course completely changed my way on looking cows, sheep or goats calmly grazing a meadow. Now that I know why they are so passionate in eating all this chlorophyll rich stuff, I start to drool. I am slowly driving on a curvy road through Slovenian Kras. After hilltop village Štanjel the road steeply descends towards Vipava Valley, another charming Slovenian region whose villages are so impeccable and cute that it feels like being in Austrian or Swiss countryside. In winter, when bura wind falls down from Nanos mountain reaching hurricane speed, the idyll disappears. The speed of more than 160 km/h is nothing uncommon here. Soon, I arrive in front of restaurant Majerija in Slap, the realm of chef Matej Tomažič whose dishes with aromas of bura and Sun enchanted me several times. He is proud of Majerija’s garden where he grows vegetables and many aromatic plants used in abundance to give a signature of the territory to the dishes. Today Matej is not going to cook at all. Instead, he invited Dario Cortese to give an introductory course in wild edible plants foraging. 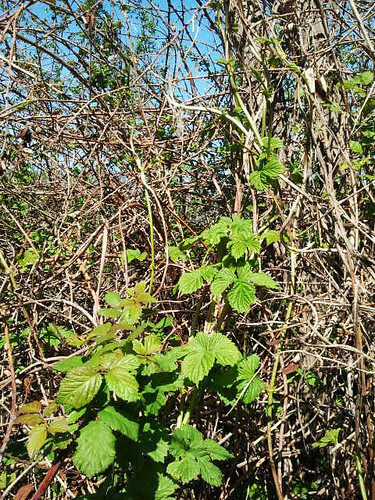 The word rapidly spread out and here we are – more than 15 foraging enthusiasts gathered on this mid April sunny afternoon. 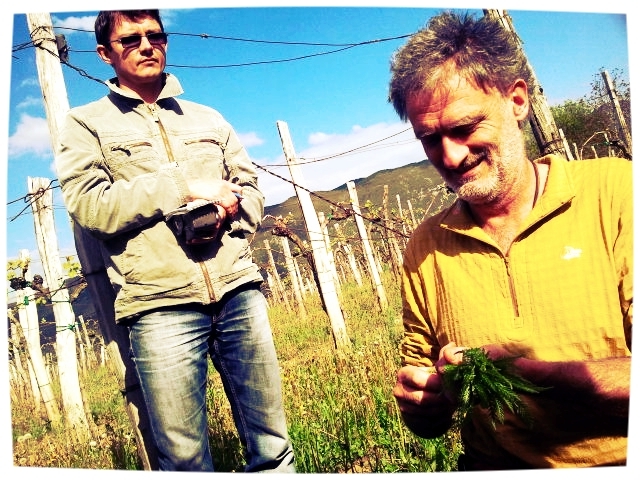 Dario is an experienced Slovenian forager who has published several books on that topic and often leads similar courses all across Slovenia and Croatia. He is also a rebellious soul whose way of eating changed several times in his life, passing through vegetarianism, veganism, macrobiotics, raw food… At one point he realized his body was not reacting well to overly dogmatic approach of all these nutrition religions. – I was just too thin and felt constantly exhausted. Now he is omnivore but severely limits his meat or fish consumption and tries to procure the meat from farmers he is friend with. When he hears me asking question in Croatian, he recommends a book from Ljubiša Grbić «Enciklopedija samoniklog jestivog bilja» that he considers THE foraging bible for the plants on the territory of ex Yugoslavian countries. – People sit 12 hours in front of computer and then, to alleviate guilt, they go to buy their groceries in local macrobiotic shop. It’s insane! Instead, it would be much healthier do some open-air activities during the day and eat krvavice and zaseka and good pork fat; he adds as we leave Majerija behind us. After only 50 meters the team stops at the first meadow, just near the local stream. In the following three hours we were walking in the radius of just 1 km around Majerija and still on every step we discovered some interesting plant. – Imagine what a wealth is hiding in all these fields and forests around us. 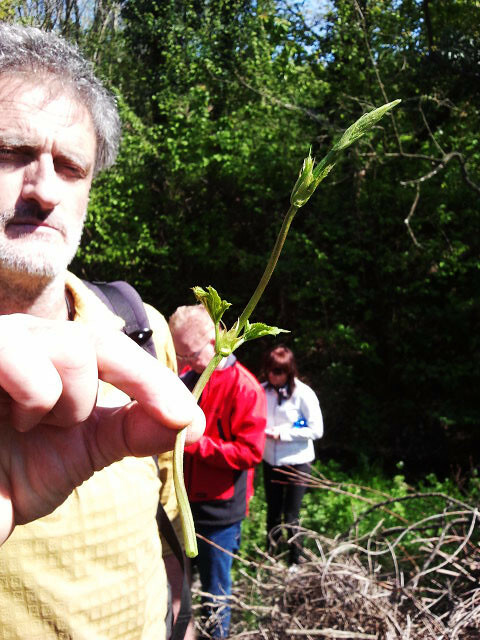 There are around 1500 wild edible plants in Slovenia. But I must add one has to be careful because there are also 30 lethal poisonous ones in this area. I am sure we’ll find at least one. Here is what we “caught” that day. Dandelion (hr. maslačak). The start seemed easy. 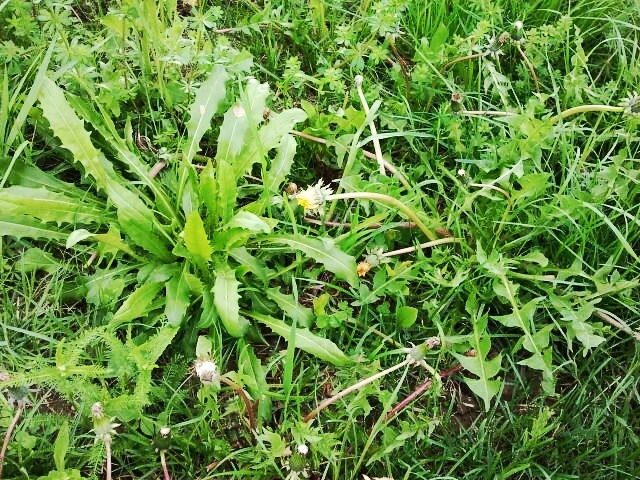 But the things complicate when you realize there are many dandelion varieties. In Istria the most esteemed one is locally called divlji radić (or lavlji zub, the plant on the left side of the pic above), often prepared as salad with boiled eggs. When it’s young pick leaves, afterwards choose buds and when the plant is grown up use flowers, they are also delicious and great for plate decoration. This rule of choosing the youngest part of the plant for nutrition can be applied to practically any plant and it is in contrast to mainstream agriculture that grows plants with the idea to use only one of its parts in nutrition (root, leaves, fruit…). Chicory (hr. cikorija). It has bright blue flowers. Both cikorija and dandelion get more bitter as they age. Bitterness in small doses is healthy since it helps digestion and purifies liver from toxins. Slightly boiled chicory in used salads, but try it also as a side dish: pour over chicory boiled, still warm potatoes, crush them with fork. Mix and season everything with olive oil, pepper and salt. 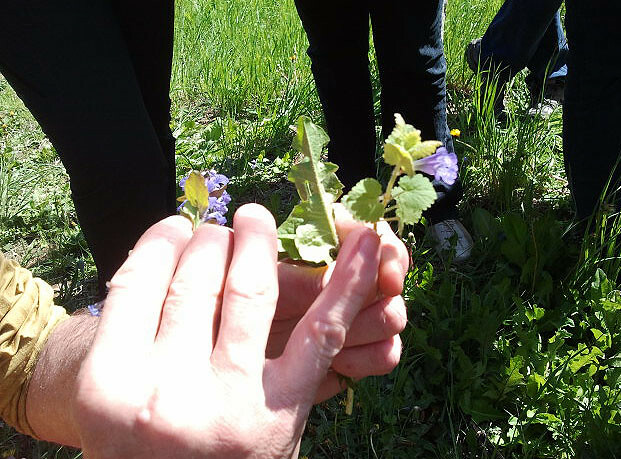 Ground-ivy (hr. Dobričica). The flowers of Glechoma are funnel shaped, blue or bluish-violet to lavender. It is used as a salad green or natural remedy for bronchitis and a general tonic for colds and coughs. Since I’m a garlic addict I was delighted to discover the existence of the following plant. Its delicate taste can be used for seasoning of buzara with mussels, clams and scampi or with various fish. Then, it came something that looks like wild asparagus but is soooo much easier to forage. In just 10 minutes you can get enough common hop (hr. hmelj) to feed the whole family and maybe brew few liters of beer, too. ☺ A climbing plant very easy to spot, usually growing near streams. Pick young shoots and cook it as soon as possible since it dries out quickly. Alternatively, freeze it. Great in salads, omelettes or, even better, steam it for few minutes and used instead of spaghetti. Pink deadnettle (hr. 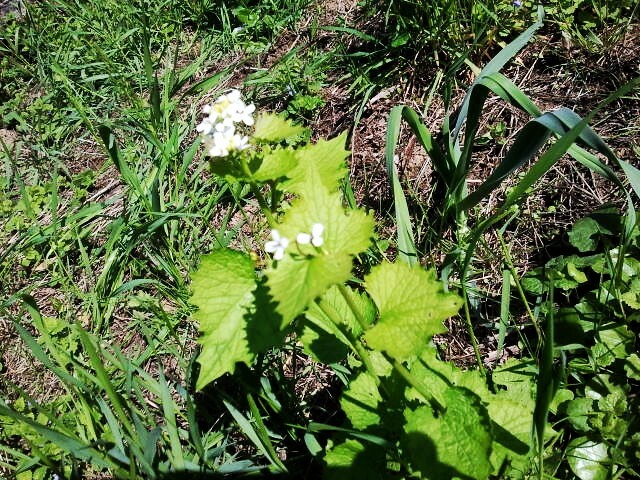 mrtva kopriva) doesn’t sting but unfortunately it is not so tasty as stinging nettle. Its flowers are the best part and because of the attractive pink color are useful as decoration. 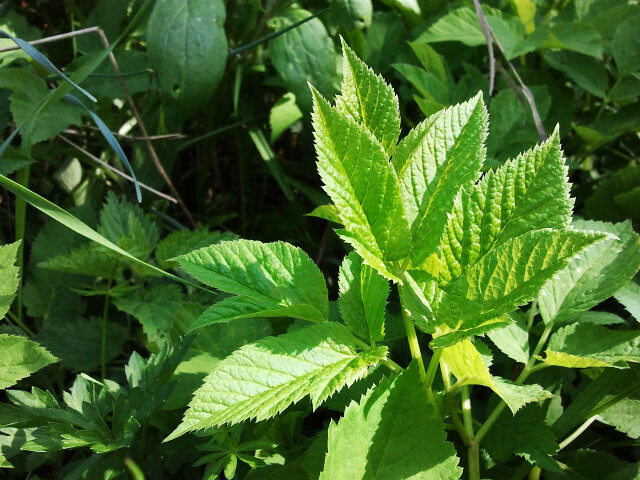 Do you know stinging nettle can be eaten raw? Here is the procedure. Cut a young sprout, take the stem in one hand and turn the sprout upside down. Then pass several times with the other hand (no, it won’t sting if you touch it only with your fingers) from top to the bottom until you remove the stinging hairs along the stem. Now, just for a second or two, rub the plant between your palms until you “cook” it. 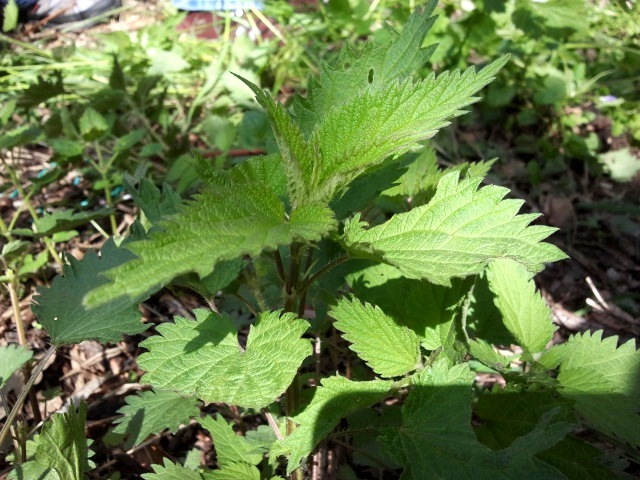 The raw nettle is richer in nutrients and has stronger taste compared to the boiled one. Nettle can be also dried and in that form added to vegetable maneštra (thick soups) or various spreads. This incredible plant has the highest protein of all green plants – from 6 – 8%. 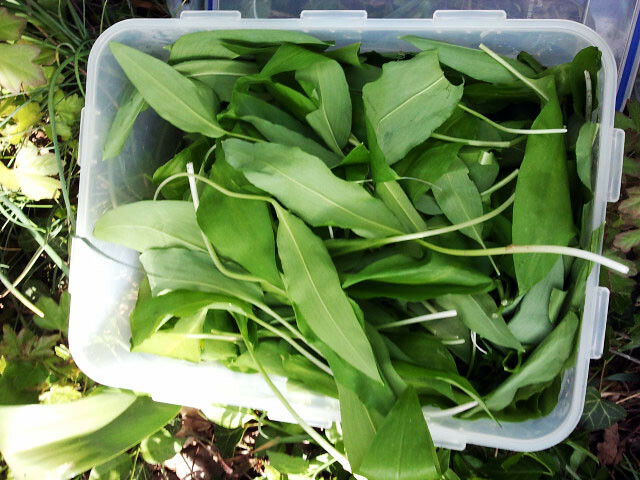 Then, we have found ramson (hr. 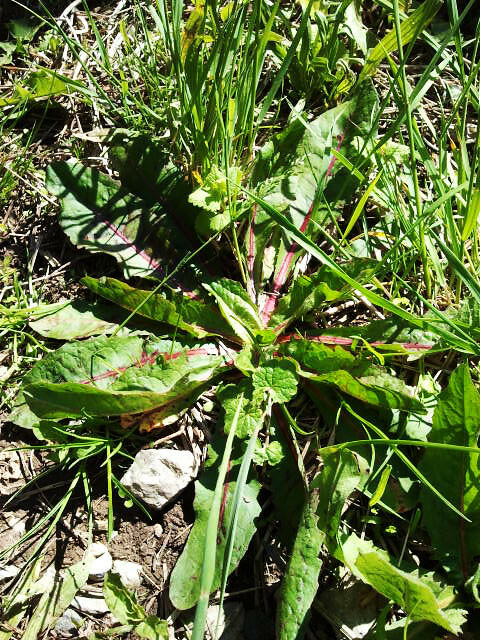 medjeđi luk, srijemuš), the most popular wild edible plant in Croatia and Slovenia and skillfully used in many dishes of Mala Hiža restaurant near Čakovec. 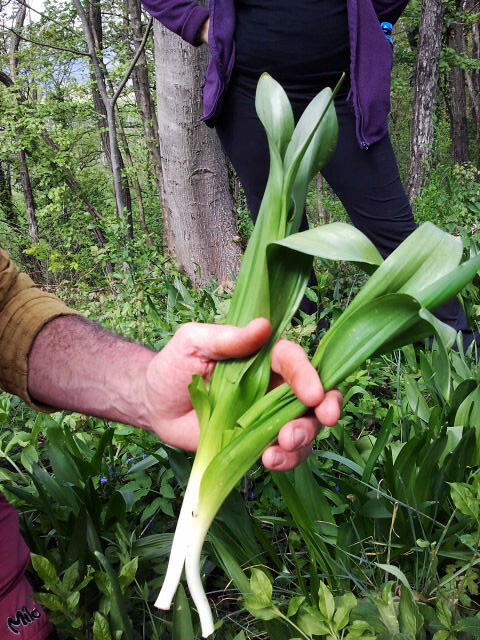 I’ll finish the first part with a deadly poisonous plant that caused many deaths this year in Croatia because it has been mistaken by inexperienced foragers for ramsons. Beware of autumn crocus (hr. mrazovac)!!! Only 5 g of it is enough to kill an adult person. Dario tells us an interesting fact – animals impart knowledge of plants and its edibility to their youngsters. While ramson has an intensive garlic aroma, autumn crocus doesn’t have any. But be careful, fingers might absorb aromas of ramson you previously touched and, thus, it is easy to make a mistake that can cost you life. In the next part you’ll discover more tasty plants and find out what did Dario prepared with them in Majerija’s kitchen. Until then, happy foraging to you all. Mushroom season should not be missed! This is so interesting! I’m totally unable to tell one plant from another so even though I love ransom, I’d be too scared to pick any… I have to try dandelion though.